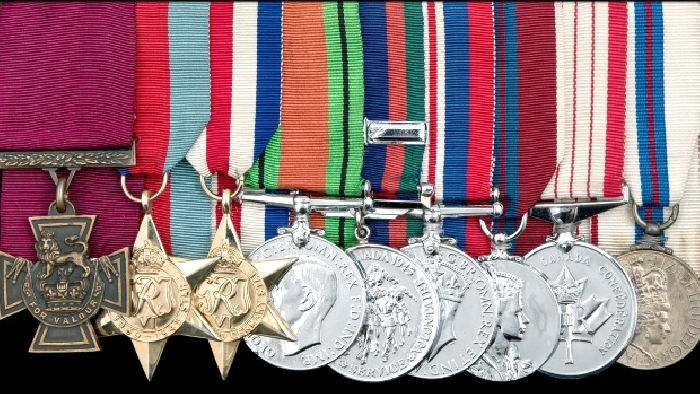 The batch of medals that was sold off in England. The Victoria Cross is at left. A Victoria Cross and eight other medals awarded to a Saskatchewan soldier were auctioned in England on Wednesday, and sold for $550,000. The medal was awarded to Lt.-Col. David Currie during the Second World War. The group of nine medals was auctioned by Dix Noonan Webb in London. According to the auction house, the medal was purchased by a private buyer from the United Kingdom. The Victoria Cross is the highest military award of the United Kingdom and has also been awarded to members of Commonwealth countries for "gallantry in the face of the enemy." Currie was born in Sutherland, Sask., in July 1912. He was awarded the Victoria Cross for gallantry during the 1944 Battle of Normandy, when he was a major in the Canadian Army. He was the only Canadian to receive the medal in the Normandy campaign. His widow sold the medal to a private buyer in 1989. Of the 181 Victoria Crosses awarded during World War II, only 16 were awarded to Canadians. Of the 16, four were for British units and those are on display in England. The curator of the Saskatchewan Military Museum in Regina said he was shocked to hear the medals were being sold at auction, rather than donated.